Bertie Reynold Gould was born in Yeovil in 1886, the son of general labourer William Gould (b1860) and Kate Alma née Hambridge (1865-1912). In the 1891 census the family were listed at 58 Reckleford where they lived with three other families in the same house. 4-year old Bertie and his 6-year old sister Beatrice were both listed as scholars. By the time of the 1901 census the family had moved to 1 Newton Road (where, some five years later, the Western Gazette offices would be built). By this time a daughter Lilly had been born. Bertie, by now aged 14, was listed as a butter worker and he would have been employed by neighbouring Aplin & Barrett. Bertie did not work at Aplin & Barrett's for long since he enlisted at Yeovil, joining the Loyal North Lancashire Regiment. His Service Number 8275 indicates that he enlisted as a professional soldier at the beginning of 1905. It is not known where Bertie served during his military service but he was called up as a Reservist, with the rank of Sergeant, on the outbreak of the war. He joined the 6th (Service) Battalion of the Loyal North Lancashire Regiment. The 6th (Service) Battalion had been formed in August 1914 at Preston as part of the First New Army (K1) and then moved to Tidworth to join the 38th Brigade of the13th Division, and then on to Blackdown. On 17 June 1915 the battalion embarked for Gallipoli from Avonmouth, via Mudros. On 31 June it landed at Helles with the 38th Brigade. On 4 August 1915 the battalion landed at Anzac and engaged in various actions. The battalion's first action was the Battle of Sari Bair, 6–21 August 1915. 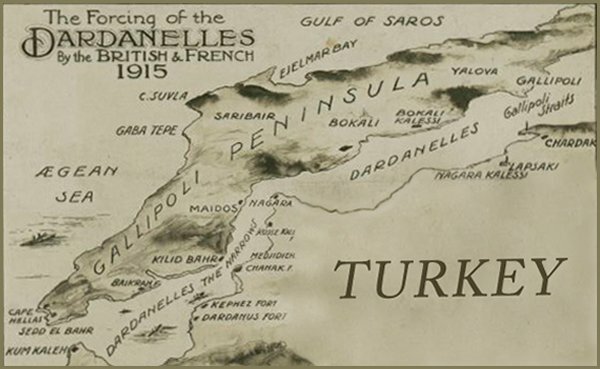 Also known as the August Offensive, this was the final attempt made by the British in August 1915 to seize control of the Gallipoli peninsula from the Ottoman Empire. The Gallipoli Campaign had raged on two fronts, Anzac and Helles, for three months since the invasion of 25 April 1915. With the Anzac landing a tense stalemate, the Allies had attempted to carry the offensive on the Helles battlefield at enormous cost for little gain. In August, the British command proposed a new operation to reinvigorate the campaign by capturing the Sari Bair ridge, the high ground that dominated the middle of the peninsula above the Anzac landing. Bertie went into action on 9 August 1915 but he received a head wound on 10 August during the battle. He was sent to hospital in Cairo but died from his wounds on 21 August 1915, aged 30. The Western Gazette, in its edition of 27 August 1915, reported "Relatives residing in the town of Sergeant Bert Gould, of the Loyal North Lancashire Regiment, have been informed by wire that he is dangerously ill, although the nature and cause of such illness was not stated, and information to this effect has not since been obtainable. Sergeant Gould, who has seen about two months service in the trenches, was called up as a Reservist on the outbreak of the war. He is well known in the town, being before the war a prominent playing member of the Petters’ Football Club, and since rejoining the Army he on several occasions assisted the Yeovil Football Club in their charity matches last season." In its edition of 3 September 1915, the Western Gazette further reported "Relatives residing in the town of Sergeant Bert Gould, of the Loyal North Lancashire Regiment, were informed by wire on Saturday August 21st that he was dangerously ill, although the nature and cause of such illness was not then stated. Letters have since been received from Sergeant Gould written in hospital in Cairo, in which he stated that he went into action of the 9th inst., and was wounded in the top of the head the following day. The contents of these letters would not have suggested that his condition was at all critical, indeed the wounded sergeant desired his relatives not to worry, as he was progressing favourably. However, the sad news came on Saturday last from his Battalion Headquarters that he died in hospital on the 21st the day on which the first news was received. Sergeant Gould, who had seen about two months service in the Dardanelles, was called up as a Reservist on the outbreak of the war. 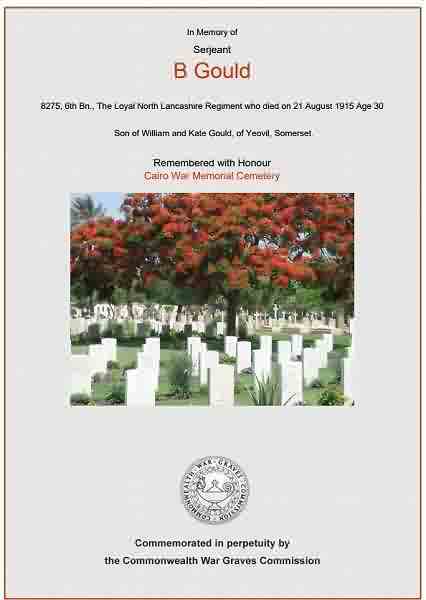 Bertie Gould was interred in Cairo War Memorial Cemetery, Cairo, Al Qahirah, Egypt - Grave D.49 - and his name is recorded on the War Memorial in the Borough. The Commonwealth War Graves Commission certificate in memory of Bertie Gould.